FaRADaY: Just so's you know...somebody left the toilet seat up. 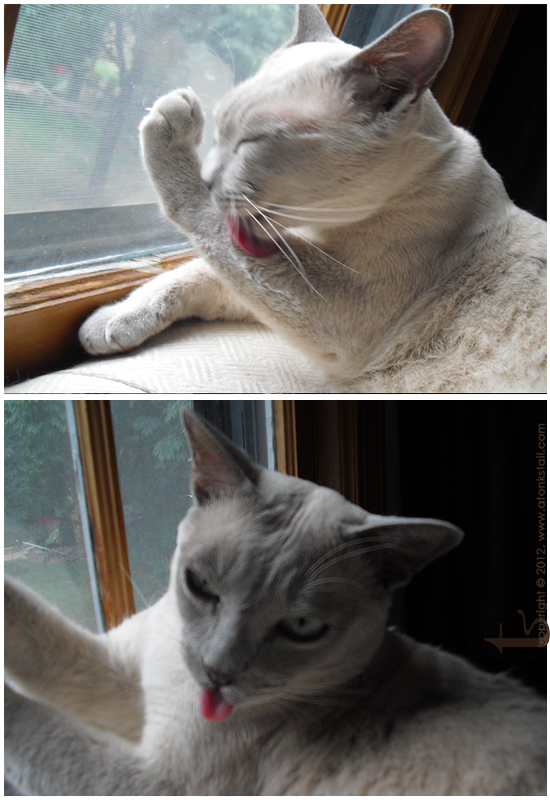 These photos are blurry cuz Mommy's LAFFING at me! And then she gave me a bath. FaRADaY: *sighhh* you have NO idea. And it was going to be a spectacular leap up onto the shower curtain too. Don't you just hate unscheduled baths? Maxwell: DOOD. He usually comes over to me for a bath. But this tongue is NOT getting near that fur until Mama bathes him. Just meowin'. Ut oh.....that happened to Tamir once!!! FaRADaY: Did you bathe Tamir too?!?! Seriously feeling sympathy over here! he he - she laughing at you because you are so darn cute (says M). Allie: Uhm...not really. *muffled giggle* He kind of looked like a drowned rat. FaRAdaY: *indignant look* It's NOT FUNNY. And I *hate* the "I'm wet" walk. Hahaha! Look before you leap if you wanna avoid a human powered bath! LOL LOL LOL! Our Mom is laffing too. Thank COD, that has never happened to us.Guess you got a second baff. Have a great day. Awwww but your Mommy loves you!!!!!!!!! OMC! Your furs got all wets after she laffed at you. Well me and my sisfur likes water so we won't hates a bath but all that shaking doesn't sound too fun. Well it could have been worse, I can't imagine how, but it could have been! That happened once with the cat BEFORE the cat before me. Interestingly, he was half Meezer (although he was 100% black). I wonder if it is something about you guys that makes you want to use those things as launching pads? A bath after that? Injury to insult! Well, I suppose it's a good thing she didnt just drop the lid, add soap and flush... Poor kitty, twice! What a pinkalicious tongue! Happy WW! You are so cute and very clean too I might add. If I would have just had a bath by the ooman, I would NOT be calmly taking my own bath. I'd be putting up a fuss somehow in retaliation for what the ooman did to me. Sorry about the bath, but look at it this way...you got it out of the way...for now! Oh noes, not terlet water!!!! It's awfully rude of her to laugh at you after it was her fault you got icky wet. But we do like the picture of you sticking your tongue out. Splash splash...you was taking a bath! Oh, my! That must've been scary. We hope the rest of the day was uneventful and fun. FaRADaY: *doubtful look* well, I don't think the scarring to my psyche has been completely eradicated. It may require more treats. A LOT more treats. Yikes! That must have been SKERRY! We can see you survived, but oh, the HORROR! SERIOUSLIES. It was a tragedy of EPIC Proportion. Sorry buddy, but your mom isn't the only one laughing.... thanks for the chuckle! Oh, no, have you considered dunking the culprit so they don't leave the seat up again? What! That was not the sound of me spashing ... er laughing! You get yourself be given a bath?? Did you make the water red with HER blood? PS: did you really fall in the toilet?? I may never drink again.